The hiking trails in Franconia are all of high quality. This is why five long-distance hiking trails have been awarded the coveted certificate "Qualitätsweg Wanderbares Deutschland": the "Frankenweg – from the Rennsteig to the Swabian Alp", the Burgenweg, the Altmühl Valley Panoramaweg and the Spessartweg Trail 1 and 2. All these trails guarantee best conditions for hikers. The 200km-long Altmühltal-Panoramaweg, a flagship trail, leads hikers along the softly meandering Altmühl River and past impressive natural monuments and historic places. On short tours or day trips you can enjoy the landscape, visit picturesque towns, baroque buildings or Roman monuments. The Fichtel Mountain region is a hiking country full of sagas, myths and fascinating wonders of nature. Shaped like a horseshoe made of granite it is located in the northern part of Franconia. 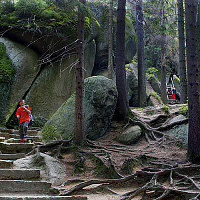 Hikers will find romantic landscapes, large forests and a „sea of stones“. This area offers a broad variety of hiking trails, some of which are accessible with wheelchairs and prams. In addition, hikers will find beautiful nature worth protecting: the northern part of the Franconia Alp belongs to the Nature Park Franconian Switzerland - Veldensteiner Forst. More than 3500km of marked hiking trails lead hikers through this attractive low mountain range. Part of this “hiker's forest” is the romantic Höllental Valley, the raftsmen country of the Wilde Rodach River, the Döbraberg Mountain, the medieval town of Kronach and the beer town Kulmbach. All these stops are part of the Frankenweg hiking trail, which crosses the Franconian Forest on a 123km-long stretch. This area abounds with rough rocks and age-old caves. Amazing views from high plateaus and mysterious caves explain why this area is called „Franconian Switzerland“. You can easily discover the beauty of the area on foot. Romantic valleys and wild rock formations make this area so distinctive. The “country of 1000 caves“ is a hiking paradise for the whole family. The lakes Altmühlsee, Brombachsee, Igelsbachsee, Rothsee, Hahnenkammsee and Dennenloher See are the highlights of this region, which features soft hills with impressive castles, as well as forests, meadows and fields. Well-marked trails lead hikers around the lakes or connect the lakes. On your way you will pass attractive villages and towns, that are scattered across the landscape. On your way towards vines and vintners. On a hiking tour across the Franconian Wine Country you can expect double pleasure: on the one hand there is a large network of hiking trails leading through forests and across vineyards. On the other hand you will be able to enjoy the fruits of the area in the form of a nice glass of Franconian wine. 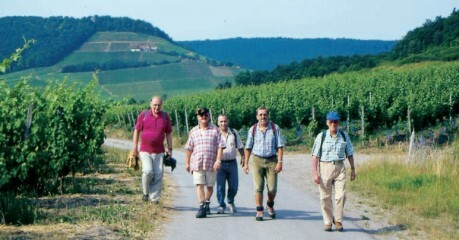 Many long-distance hiking trails like the Mainhöhenweg or the Mainwanderweg lead past the main wine-growing areas. Mixed forests, meadows, picturesque villages, steep sunny slopes and soft hills: The Nature Park Hassberge is an adorable and untouched hiking region. 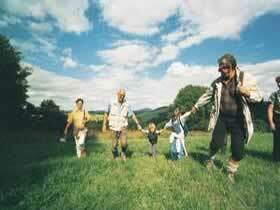 A network of trails with circular tours as well as long-distance trails offers best conditions for relaxed vacations. It takes about 8 days to discover the Hassberg Mountains on the Castles and Palaces Trail. This 180km-long circular trail forms a large oval within the nature park. 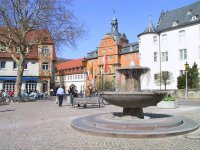 The quartet of Franconian history: Nuremberg - modern fair and medieval city, Erlangen – baroque city and research center, Fuerth – city of monuments and Schwabach – city of gold-beaters. The city centers offer cultural highlights as well as many green areas, and there are unlimited hiking possibilities around the greater urban areas: There is for example the forest "Nuremberg Reichswald" with its numerous hiking trails. It has recently been reforested and turned into a natural paradise. Besides the routes of the Way of St. James, the Frankenweg leads through the Nuremberg region. 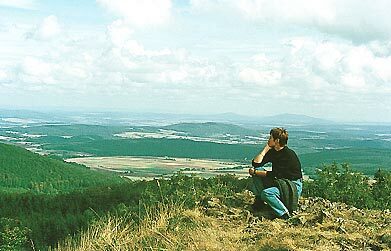 The 517 kilometer long distance hiking trail leads from the "Rennsteig" to the "Schwäbische Alb" (Swabian Alb). Nature meant well for the Upper Main Valley – Coburg Country. It has been endowed with numerous different landscapes, a diversified network of hiking trails and some of the most magnificent buildings of Franconia. Exhausted hikers can take a break at the spas of Bad Staffelstein or Bad Rodach. Due to its rivers Fulda, Werra, Ulster and Fränkische Saale as well as the numerous bogs, hedgerow countries and deciduous and mixed forests the Rhoen has been declared a biosphere reserve by the UNESCO. Hikers benefit from this fact as well: more than 600 km of designated hiking trails lead through this natural and diversified region. No matter if you visit the Kreuzberg Mountain, the Franconians „sacred mountain“, or the nature reserve „Schwarzes Moor“ – hiking in the Rhoen means discovering a untouched world. 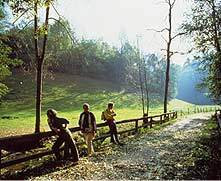 With its large forests, beautiful valleys and fantastic view points, Romantic Franconia is an excellent hiking region. A major part of the area is made up of the Nature Park Frankenhöhe, with steep slopes in the north and the east. The rivers Altmühl and Franconian Rezat originate here, at the site of the European water divide. Together with its large forests and Bavaria’s biggest mixed orchards this is the perfect area for an extended hiking trip. Where else would one find such great hiking areas: the forests of Spessart and Odenwald, only separated by the River Main, really are unique - meadows and vineyards, plateaus with great views and romantic valleys, with natural brooks winding their ways. The quiet forests of the Spessart are no longer home to wild thieves but to happy hikers, who enjoy the area’s ideal hiking conditions. The weather conditions in the Steigerwald Forest are usually very good: it is one of the areas with the lowest rainfall in Germany. But an even greater asset is the area itself, with its beautiful low mountain ranges and mystical mountains, fantastic views, glittering lakes and amazing hospitality. This is a hiking area that combines opposites in harmony: the large Mainbogen (Main Arch) in the north, the carp ponds in the south, as well as shady forests. 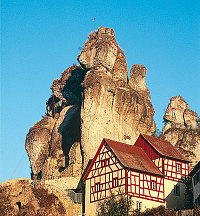 idyllic valleys and towns with timbered houses, castle ruins and picturesque palaces. There are numerous wonders of nature to be found along the Tauber and in its valleys. You can discover the quiet beauty and the hospitality of the area on the Main-Danube hiking trail and on 30 other regional circular trails. After a day of hiking you can fill up your energy with some delicious wine and some Franconian traditional food.